Scientific research is pursued for many reasons. Curiosity. To solve a problem. To invent something new. The pure pursuit of knowledge. And because the processes of nature that science can reveal are beautiful. It’s this aesthetic component that keeps many people in science, and it’s certainly why our next curator, Steve Maguire (@sciencenotscary) is in science. Steve Maguire is the 2013 winner of the Flame Challenge (Video), sponsored by the Alan Alda Centre for Communicating Science. He is currently teaching chemistry at Lakehead University’s Orillia campus, around 80 miles/130 km north of Toronto, in Canada. Steve did PhD work at the University of Ottawa under Professor Tom Baker (no relation to Doctor Who), and obtained a Masters at the same institution with Professor Tito Scaiano. Steve’s research interests are in iron-catalysed production of biofuels (PhD) and photogenerated nanoparticles (MSc). Steve is also the creator and host of Science Isn’t Scary, a YouTube series describing everyday science in everyday words. Steve swears he is going to be famous some day, just you wait and see… which if it happens this week, we’ll know all about it! 1. How did you end up in science? What is it that interests you about science? I’m a scientist because of Star Trek. I identified with the character of Wesley Crusher (I was the obnoxious kid that nobody liked). I got into chemistry because of my high school chem teacher. I like how science is part storytelling, part detective work: building a picture of something from evidence gathered from multiple avenues of investigation. 2. What is it about science communication that got you into it and keeps you there? I got into scicomm because it combines three of my interests: science, teaching and theatre. I’m an incorrigible ham, and when I was in grad school I didn’t have enough time to commit to doing plays. Doing science outreach was the only way I could indulge my passion for the stage. I did Chemistry Magic Shows for an organisation called Let’s Talk Science. 3. Where did you grow up, and how did you come to be where you are? I was born in North Vancouver, British Columbia, Canada and lived there until I was six. We moved to Brisbane, Australia (my dad’s home town) for a couple of years before returning to Canada and settling in Kelowna, BC. I did my B.Sc. there at Okanagan University College (which has since been assimilated by the University of British Columbia), and grad school (M.Sc. and a failed PhD) at the University of Ottawa. Currently I’m finishing up a year of teaching at Lakehead University’s branch campus in Orillia. 4. Any hobbies outside of your work? Theatre and role-playing. After spending what seems like an eternity in grad school I’m rediscovering what it’s like to have free time. The first day of my tenure at @realscientists is the last performance of Inherit The Wind. I play Bertram Cates, the young schoolteacher on trial for teaching evolution. Playing a science teacher was a huge stretch for me. 5. Can you talk a bit about the What is a Flame challenge? It sounds very cool. The Flame Challenge was started by Alan Alda (of M*A*S*H and Scientific American Frontiers) based on an incident in his childhood: he asked his teacher what a flame was, and she said “It’s oxidation, go away”. He wasn’t happy with that answer, so in collaboration with the Centre For Communicating Science at Stony Brook University, he started this contest for scientists to clearly and concisely explain to an 11-year-old audience what a flame was, and the entries would be judged by actual 11-year-olds. I didn’t hear about it in time to enter during the first year, but the second year, I won. The question, What is Time?, was selected by the kids themselves. My video can be found here: http://www.centerforcommunicatingscience.org/the-flame-challenge-2/meet-the-finalists/, along with the winner of the written category. The approach I took was to not talk down to the kids. I remember being eleven myself – dimly – and the one thing that annoyed me most was being patronised. I was careful not to use that fake-enthusiastic tone that so many children’s presenters use, and instead talk to them as if they were friends or colleagues. I tried to keep it simple, but I threw in a couple of technical terms and then defined them – people say not to use jargon, but I disagree. If it’s a term you can easily define with a quick aside, by all means take the opportunity to teach your audience a new word. 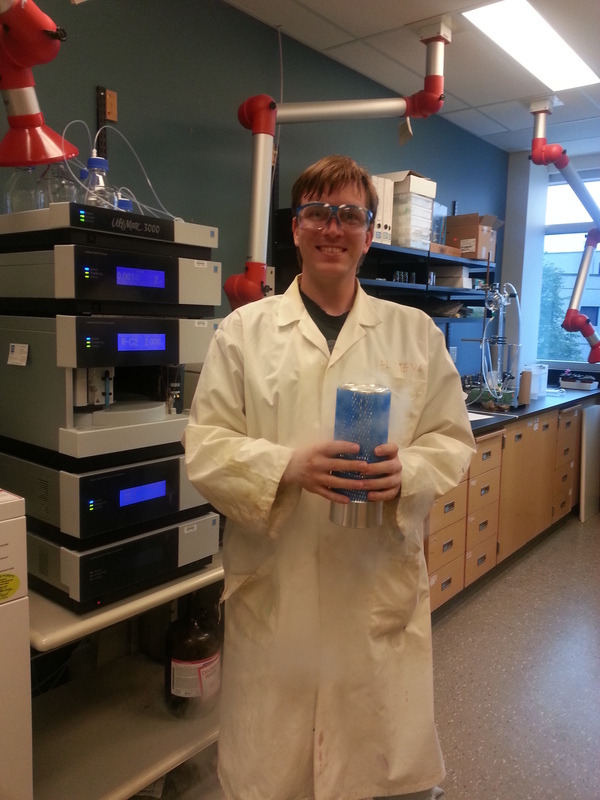 So please welcome Steve Maguire, chemist, thespian and champion science communicator, to Real Scientists!